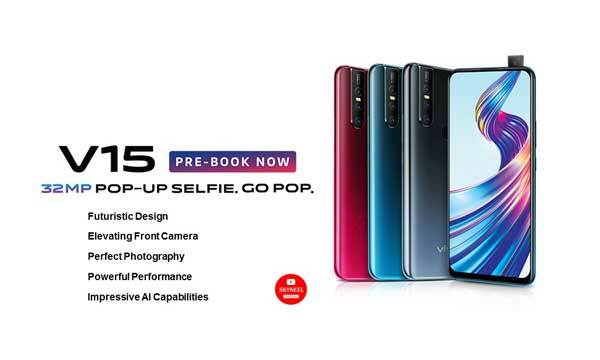 Vivo V15 smartphone was launched in February 2019. This smartphone comes with a 6.53-inch touchscreen display with a resolution of 1080×2340 pixels and an aspect ratio of 19.5:9. Vivo V15 powered by a 2.1GHz octa-core MediaTek Helio P70 processor. The Vivo smartphone is a dual nano sim smartphone. This smartphone powered by 2.1GHz octa-core MediaTek Helio P70 processor. The Vivo V15 runs Funtouch OS 9 based on Android 9.0 Pie and packs 64GB of inbuilt storage that can be expanded via microSD card (up to 256GB). Buy Vivo V15 on Amazon. This smartphone runs on Android 9.0 Pie, based on Funtouch OS 9, powered by a 4,000mAh battery. This smartphone supports proprietary fast charging. Vivo V15 smartphone priced in India could be Rs. 23,990 and available in Topaz Blue, Glamour Red, Frozen Black, Royal Blue color options. This smartphone comes with 6.53 inch smartphone with 1080 x 2340 pixels resolution. It is powered by 2.1GHz octa-core MediaTek Helio P70 processor, paired by Mali-G72 MP3 GPU. This smartphone comes with Corning Gorilla Glass 5 protection. You can buy this smartphone from Vivo India e-store, Amazon India, Flipkart, PayTm Mall and other offline channels from April 1. Under the launch offer, this phone has an exchange buyback offer of Rs 10,000. In addition, 5% cashback is available on payment from SBI credit and debit cards. Apart from this, Vivo has partnered with Reliance Jio for this phone, under which a benefit of Rs 10,000 is available. It is also getting 3.3TB, Jio 4G data. It is also getting exchange value of Rs. 2,000. If we talk about the camera, this smartphone comes with 12-megapixel primary camera with an f/1.78 aperture; a second 8-megapixel camera with an f/2.2 aperture and a third 5-megapixel camera with an f/2.4 aperture. The rear camera setup has autofocus. You can also get a 32-megapixel camera on the front for taking selfies, with an f/2.0 aperture. You can get LED flash, panorama, HDR, video recording at 2160p@30fps. The dimension of this smartphone measured in 161.2 x 75.9 x 8.5mm with 189.5g weight. The Vivo V15 runs Funtouch OS 9 based on Android 9.0 Pie. The Vivo V15 is a dual-SIM (GSM and GSM) smartphone that accepts Nano-SIM and Nano-SIM cards. As per Connectivity concern, this smartphone include Wi-Fi, GPS, Bluetooth v4.20, USB OTG, Micro-USB, FM radio, 3G, and 4G (with support for Band 40 used by some LTE networks in India). Sensors on the phone include accelerometer, ambient light sensor, compass/ magnetometer, gyroscope, proximity sensor, and fingerprint sensor. The Vivo V15 supports face unlock.